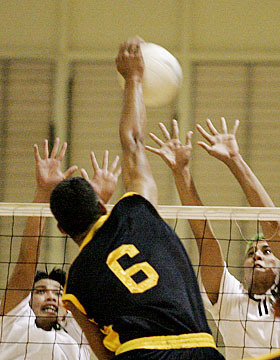 Waipahu's Malosi Saolotoga spiked the ball past Aiea's Darryl Talaro, left, and Dewey Mark during last night's match. Malosi Saolotoga knows patience quite well. The calm Waipahu senior sat through his team's regular-season defeats, including one to Aiea, with an ankle injury. Once he returned, however, the Marauders played at championship form. Saolotoga pounded seven kills as Waipahu swept Aiea 25-14, 25-21 last night at Farrington's gym to win the Oahu Interscholastic Association Division II boys title. "I feel excited," said Saolotoga, a high-leaping 5-foot-9 outside hitter. "Some of my teammates were talking about states, but I didn't want to talk about that. I wanted to take OIA first." Waipahu (13-2) will be the OIA's top seed at next week's Division II state championships. Aiea (13-2) will be the No. 2 seed from the OIA. Both of Na Alii's losses came at the hands of Waipahu. Pili Taitin paced Aiea with five kills, all in the second game. He did not play in the opening game as a disciplinary measure. "Pili is really good, but when he didn't play, that made it easier for us," Saolotoga admitted. Waipahu simply was the more composed and confident team. Aiea went through stretches of unforced errors and head-hanging. The Waipahu Marauders celebrated after capturing last night's OIA Division II Championship at Farrington. "There's more drive on our part. Losing to Aiea before made them hungry," Waipahu coach Julna Pasicaran said, referring to a regular-season split with Na Alii. Waipahu's block, featuring Saolotoga and Pioli Falaniko, forced Aiea's hitters into a multitude of tip shots. "Our blocking has been weak during the season, but today it was better," Pasicaran said. Aiea led the opening set 8-5 before losing concentration. Waipahu went on a 16-3 run to put the game out of reach. The Marauders needed only six kills to take the first set, but service aces by Paul Fai, Saolotoga and Falaniko helped. Aiea regrouped and led 19-16 in the second game thanks in part to Taitin, Michael Tabarejo and Kaiona Wood. However, mistakes hurt Aiea again. Waipahu roared ahead with five points in a row, including three hitting and passing errors by Na Alii. A kill by Taitin brought Aiea within 21-20, but Waipahu closed out the match with kills by Ricky Rapanot, Saolotoga, Fai and Falaniko. Aiea coach Erin Okamoto Coker looked at the defeat philosophically. "Our teams are really close, but grade checks can make a difference," she said, referring to a starter who missed the match. "This will help our team be more serious at practice instead of fussing around."